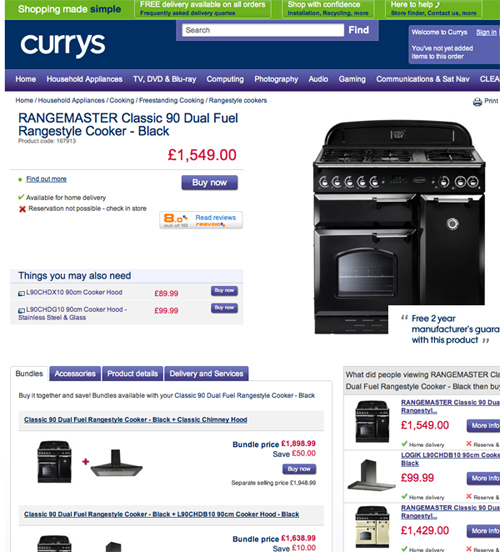 Update: Today, Currys.co.uk resolved my issue by offering me a better cooker than the one I placed the order for, at the original price I purchased it for, offered free installation, a £50.00 giftcard and a four hour delivery slot. As well as apologising for the terrible customer service received on the phone. They are/will be speaking to the team in question to ensure they are aware of the fact they should have fulfilled the order at the original price in the hope no one else has the issues I experienced. So, one of the most stressful things about moving home, especially when it needs a new kitchen, is getting yourself straight, and waiting around all day for parcels, packages and appliances, that can be delivered in any given time slot, between 9am and 6pm. That’s exactly what happened on Monday, Stu and I waited in all day for a cooker that Currys said would be delivered on the 4th July – said cooker was purchased for £999. You can guess what’s coming next, we get to 4.30pm – still no cooker, so I call Currys to check where the delivery driver is. I’m then notified our order was cancelled. Cancelled without warning, no calls, no emails, nothing. They obviously think we like sitting around an empty house all day? I should point out, the money had come out of our account (or gone on the credit card actually, we like gathering Virgin Air miles!) for the cooker. They only started to process a refund after I called on Monday. I call Monday and I’m told that Currys.co.uk will honour the original price of the item, but they would have to put it through at the new price, and then rebate us the difference, but that I would still have to go through the original security checks, which would happen on Tuesday. Guess what? No calls all day on Tuesday, so I call them to confirm the security bits and I’m told to expect a call in 24 hours. Currys.co.uk called this morning, left a voicemail, and I called them back within 2 minutes. I call back, eventually speak to a manager (Mark) who explains that because I didn’t answer my calls on the 25th & 27th June (the calls, that didn’t happen remember) – he took the liberty of cancelling my order? When I start to proposition that they cancelled the order due to the price jumping up over £500, I’m shot down and told that it was simply because I didn’t answer my phone to the security check calls, the calls that never happened. The phone was glued to my hip the entire week prior to moving, it was a hot-bed of activity, and funnily enough, other suppliers of other appliances for our house had no problem getting in contact, neither did anyone who was delivering furniture – my phone just must have an aversion to picking up calls about Cookers. Note to self: must notify Apple of this. So, the outcome? We’re cooker-less because Currys won’t honour the original price we paid for it, despite knowing I can prove they didn’t call me. Basically, it’s dirty tactics, and I think they should feel the full wrath of social media for it. @currysonline if you smell a rat too! Sometimes we have to hold our hands up and admit we have made a mistake by unintentionally publishing inaccurate information on the site (e.g. the price, description or availability of a product you have ordered). In this instance, we may have to cancel your order at any time up to the point we send you the product(s), even if you have received your Order Confirmation email, and you will receive a full refund of any charges already paid. Just what everyone likes, a flakey supplier. Expecting that dishwasher to turn up anytime soon? Maybe they played the “cancel order” lottery and you were unlucky. Unfortunately, you won’t know until you’ve waited in all day and your goods haven’t arrived.